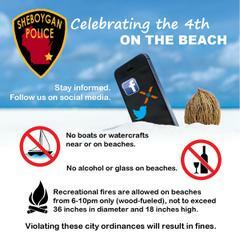 7/4 Reminder: No alcohol/glass on beaches, bonfires 6-10p, no larger than 36" dia,18" high. No boats near beaches. Alcohol: Alcohol possession and consumption is PROHIBITED ON ANY BEACH area in the city. Alcohol may be possessed and consumed on the area of Deland Park that is south of the pier (the vendor area), and on the grass area of King Park. ABSOLUTELY NO GLASS CONTAINERS on the beach and within any city park. Bonfires: Recreational fires are allowed along Lake Michigan shoreline between 6pm-10pm, Fires can be no larger than 36” in diameter and 18” high. DO NOT BURY fires at the end of the evening. Fires may be extinguished with water or left safely to burn. Boats: Boats and watercraft must remain clear of beaches.